Congratulations Eve & Sheldon! Got more wedding photos? rideforsmiles, just jeff and dedad71 like this. Congratulations to you both! Awesome journey mate! Love the picture of you two and your bike Sheldon. Got any more pics? You wearing a tie Sheldon???? LOL - Ewa you look amazing! Congratulations on the wedding and the plans for Russia too. Now.....babies???? rideforsmiles, bungen and Seenyah like this. Forget pictures of the wedding.. where are the pictures of the honeymoon??? Bucket1960, rideforsmiles and vintagespeed like this. Nicely done Mr and Mrs Thomson. rideforsmiles and Seenyah like this. yeah, from that far away.....almost looks like Ewan McGregor.........almost..... :) Congrats you two! I'm sitting here in tears, not sure whether it's because your trip has finished or you completed it with such a happy ending. Wishing you the best of luck and much happiness in your new lifestyle. There aren't words to say how much I've enjoyed traveling along and how much I'll miss reading of your world travels. That's really nice Coastiebiker thanks alot. With it being Christmas time and all the gifts flying around both Ev and I feel like we have been given a life time of presents over the last few years and all the support from everyone like yourself has been one of them. A lot of people have asked me how does it feel to be married and I just say well its been 2 weeks and I've been drunk 4 times does that answer your question, thank goodness it's Christmas time and I can use that as an excuse to be hitting the bottle Ev has been loving it shes been all over me like a rash, its like having an annoying cat that just keeps jumping on your lap, I keep pushing her off but she just keep lunging at me and instead of purring shes saying my husband, my husband, its got me wondering if the brainwashing is another thing I went a little overboard with. For us in the future my eldest son Jared, Ev and I are meeting in Russia in June and I'll be leaving a few months earlier than that so my plans are set to be back on the bike when it warms up and without setting any new year resolutions Im pretty determined to ride that Stans Russia Mongolia leg of any round the world ride. Hope you (Coastiebiker) and everyone else had a great Christmas and have a fun and safe New Year and thanks again for everyones support throughtout 2017. The mods have asked me to stop posting as its supposed to be a site for adveture bike riding trips and although I understand that it feels like Im still on an adventure cause here I am in a random city in Poland and as you can imagine that feels as far away from home back in Australia as it could be and certainly doesnt feel like my adventure is over but just starting. I'd really like to be able to share some of that with you guys along with the wedding photos when we get them so hopefully they will give me a bit of leeway for the next few months till Im back in the road. OldFartRidesAgain, BillUA, V4FAN and 10 others like this. yes, would like to see the wedding pics, might put them on your FB page. 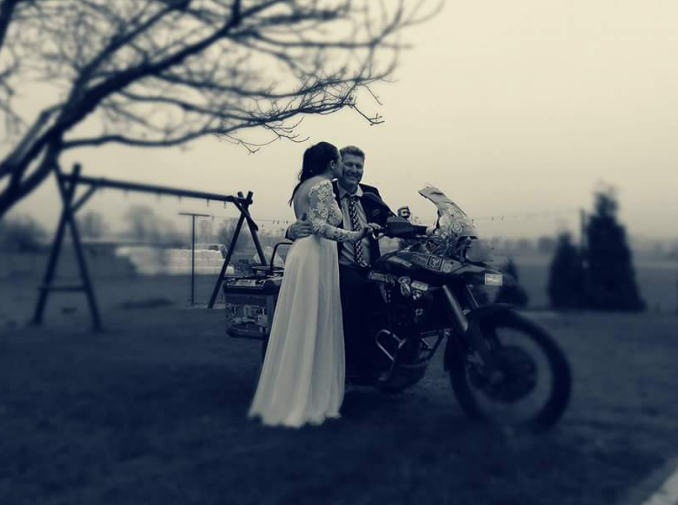 Two things Sheldon....You should be able to start a thread down in inmates to post your party/wedding pics with no issue if im not mistaken.Just cant continue here in ride reports is all. Call it The rideforsmilesafterparty. Either way if you do that or when you start a new ride thread post a link here so and any followers will be automatically notified of the new thread. OldFartRidesAgain, OldTriumphRider, Seenyah and 3 others like this. Congratulations Sheldon and Ewa, what a story mate, looking forward to your Russia trip and the world cup too!! might as well shout for the Aussies cause we didn't make it. happy new year to you both. We need those posts until you're back on the road, Merry Christmas and Happy New Year from the coldest capital city in the world, Ottawa Canada at minus 40. Spring is just around the corner! OldFartRidesAgain and Seenyah like this.